The security situation in Afghanistan and the role of the German army are topics of controversial discussion in the German media. 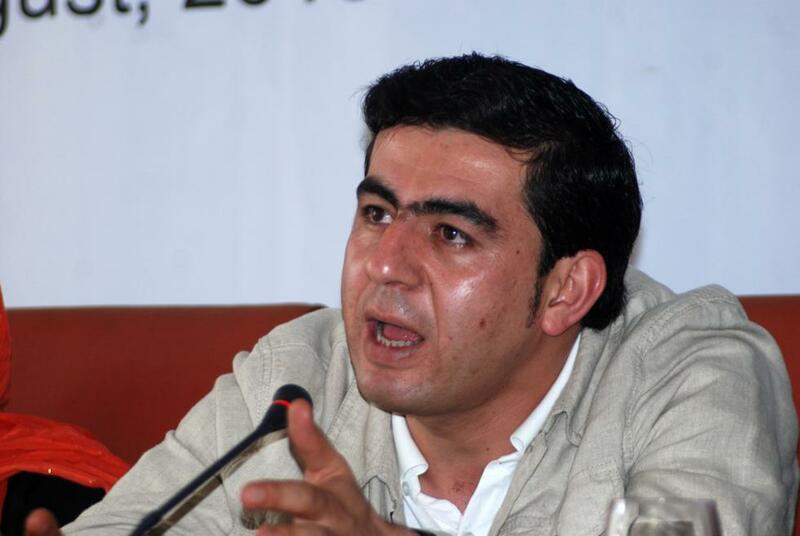 Prior to the election of the parliament Sanjar Sohail, Afghan journalist and chief editor of the daily paper “Hasht-e Sobh” (“8 am”), talked to the Heinrich-Böll-Foundation about working conditions for journalists and the reputation of the German troops in Afghanistan. 1. Sanjar Sohail, you are the chief editor of the daily newspaper “8 am” in Afghanistan. Could you tell us what it is like to be a journalist in Afghanistan? Sanjar Sohail: In the past nine years we have had a revolution of the media sector in Afghanistan. From a country of no voice, no picture, no television, we became a country of having 35 private TV stations, 100 private radio stations and around 250 newspapers. We have one of the best media laws in the region – we can say, we can write anything we want. There is no censorship in Afghanistan. And it is also interesting that about 75 percent of the people are listening to the radio. And around 40 to 50 percent are watching TV. Being a journalist is a dangerous job in Afghanistan. In the past nine years we have lost about fifteen journalists in different incidents. Just two days ago one of our famous news anchors was stabbed in Kabul. So it is dangerous because we always have the problem of accessing the information in the war zone. And the Taliban are not helping the journalists, but are always trying to capture and kill them. Also we unfortunately do not have the act to access the information. So that is why we are sometimes facing the problem of having exact information from the governmental institution. 2. Do you work together with the military forces? Sanjar Sohail: No. I don’t. But the military units are providing protection for journalists to go to the war zone and have their reports. But, of course, if you go with the military people , you will not get proper information. 3. Considering the case of the young journalist who was sentenced to death at first in 2008 for downloading and distributing a report about Women Rights in Islamic countries: Is it difficult to write about certain issues? Sanjar Sohail: We have some red lines in our media law, like all countries have. We cannot write or talk about secret military issues and documents or about secret documents of intelligence. We cannot write bad things about religious issues, we cannot humiliate other religions, including Islam. Afghanistan is a country of war. And still there are some figures that have the traditional power; the religious power and they can do something against journalists, against intellectuals. In the case of Parwez Kaambakhsh you are talking about: he was sentenced in a court, but now he became free. He is living somewhere in the west. So it happened, but the human rights institutions, the civil society, and the media tried to work with different governmental institutions to free him from prison. 4. And is it easy for you to write about politicians? Sanjar Sohail: On political issues, yes, there is no regulation. We can write anything we want. Every day, every hour you can see the criticism against president Karzai, the criticism against other top officials on the news, in the newspaper, on the radios. So there is no regulation of criticising top officials. 5. Germany’s engagement in Afghanistan has been criticized a lot lately, at least in Germany. Especially after the German army was responsible for attacking the hijacked tanks in Kunduz. Could you tell us how the Afghan media reported on this incident? Sanjar Sohail: First of all, let me talk about the incident in Kunduz. The Germans have investigated a lot, but it is still the question whether all the people were civilians or not. Usually in Afghanistan people are sleeping around ten o’clock because of no electricity, no entertainment possibilities like going to a restaurant or the cinema – especially in the villages. So we still do not know why civilians came at two o’clock at night to have fuel from that tank. I think the criticism that rose in Germany against international troops, especially German troops, in Afghanistan, is not based on reality. Afghanistan’s situation is different from what people think in Germany. We are fighting against very bad people who are not considering the values and beliefs of other people. So we have to fight against them in order to have a better, a responsible government, a better life for the people of Afghanistan. If we lose Afghanistan, then the Germans might have to fight against these terrorists at their border. This is not a war of choice. This is the war of obligation. They have to fight this war and they have to finish this war. 6. Is this also how the Afghan people see the German troops? Sanjar Sohail: Last year there was a survey among Afghan people. About 75 to 80 percent of the people are still supporting the presence of international troops in Afghanistan. Well, there are some mistakes, some wrong things going on that have to be improved. But still the people of Afghanistan need the international troops, because they do not want the Taliban to come back to power. 7. A new Afghan parliament has been elected on 18th of September. After having had the first election after almost 40 years in 2005: What are the expectations of the Afghan people towards the election and the parliament in general? Sanjar Sohail: Afghanistan is a country in transition. We are exercising every step of democracy. The next election will also be kind of an exercise for the people of Afghanistan to know that they have the right to choose their parliament and the government. Considering what we experienced with the first parliament, I think the people need a very strong parliament for having a presence of the parliament and decision making to bring changes in the law for improvement of their life. And also they want to have a strong parliament because for long decades we have witnessed the centralisation of power. So, most of the people are looking at the parliament as a way of development, as a way of having a better life in the future. But as the country is still in transition, there will be some shortage of idealistic democracy. And of course, there will be some people in the parliament who are not fed with the values, with the ideals we have. 8. And what are your personal expectations towards the new parliament? Sanjar Sohail: I think there are some changes from the past election to the new election. For example, there were 370 female candidates in the past election – and now we have about 400. Also there is a number of young people, who nominated themselves for the parliament. That a young generation of Afghans believe that they can change their life, their future with their participation in the democratic processes is a change.But there are also some bad changes. Unfortunately, we have lost the very credible people from the ECC, the Election Complains Commission. We have the same institution but the people working there, they are not in this institution anymore. So the ECC became a little bit of a governmental rather than an independent institution. So I worry that this ECC could close their eyes on fraud and some irregularities in the election. I am also worried about the security of the Election Day, about the misusing of government recourses for particular candidates. During the presidential election campaign in Afghanistan in 2009 the UN-supported Election Complains Commission (ECC) publicized several manipulations during the electoral process. This led to the annulations of millions of votes. Two of the ECC board members were nominated by the Afghan Supreme Court, three members by the head of the UN-Mission in Kabul. In spring 2010 President Karzai was able to install a greater influence of the Afghan Government regarding the board nomination, which on the one hand led to more afghan ownership, but was also seen as a decrease in the ECCs independency. Interview by: Janne Bavendamm, Heinrich Boell Foundation.